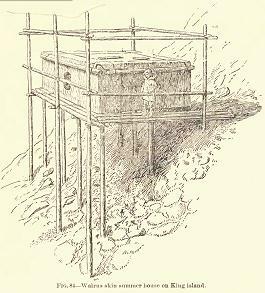 Construction of the trans-Atlantic telegraph cable pushed the limits of 19th Century technology. In the 1860s construction was begun on an alternative telegraph line to Europe - across Alaska, under the Bering Strait, and across Russia. Capt. Daniel B. Libby was in charge of a telegraph construction team that wintered at Port Clarence on the Seward Peninsula in 1867. Libby was 25 or 26 at the time. In March 1925 a roughly dressed man visited the Juneau law offices of James Wickersham. The man, Libby's son, needed money to get to Copper River where he understood he could find work as a welder. He had a packet of papers - his Dad's papers from the Port Clarence days: letters, records, pictures, and a five by seven inch brown notebook with a diary for 1867. Was Wickersham interested? 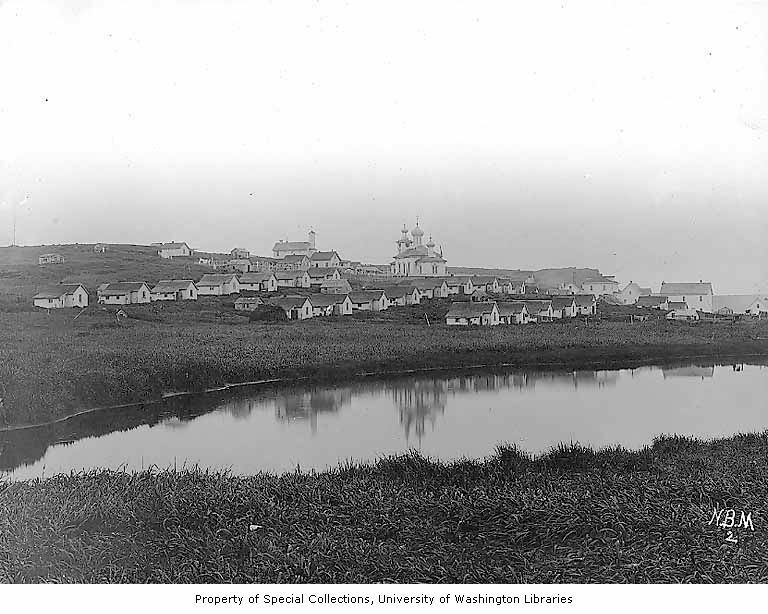 Apparently Wickersham was; the diary was in the Wickersham papers for many years, and is in the Alaska State Historical Library today. 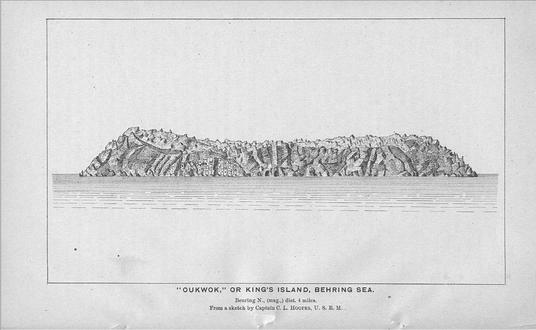 A few days ago I posted on a visit to King Island by the U.S. Revenue Cutter Corwin in 1881 (A Visit to King Island, July 12, 1881). The Corwin, under Captain Calvin Hooper, also visited in 1880. 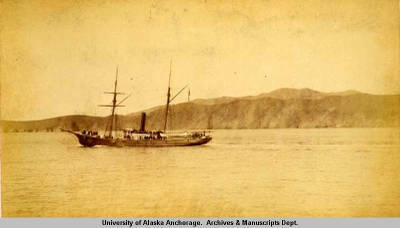 Hooper's report was published in 1881: Report of the Cruise of the U.S. Revenue-Steamer Corwin in the Arctic Ocean . I've pulled various posts dealing with the Arctic and copied them into a new site called Arctic Economics. I'm going to use that weblog to explore the economics of global warming induced Arctic climate change. 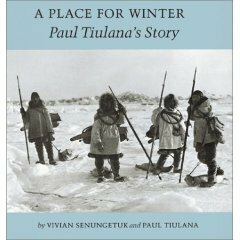 Lots of explorers entered the Arctic and died there because - among other things - they couldn't find anything to eat. Sir John Franklin led two expeditions to disaster; on the first his followers ended up eating each other for lack of anything better. In March the Arctic ice cap reaches its greatest annual extent. And this year's March ice cover only a little smaller than it's been it the past. But look at this: red indicates one-year old seasonal ice. That's important because the seasonal ice is thinner and melts faster. The ice cap is smallest in September and last September it was as small as we've ever seen it. We still don't know what will happen this summer, but the ice cap is starting the season with a big strike against it. "The new Strait of Malacca"
US Coast Guard Admiral Brooks may have exaggerated somewhat in his comparison of the Bering Strait and the Strait of Malacca, but he does expect a lot more traffic through the Bering Straits in the next 10 to 20 years: U.S. needs to prepare for Arctic traffic surge (Tom Kizzia, Anchorage Daily News, Feb 14). That's the tip of Russia's Chukchi Peninsula on the left, and the tip of Alaska's Seward Peninsula on the right. The shortest distance across is about 55 miles. 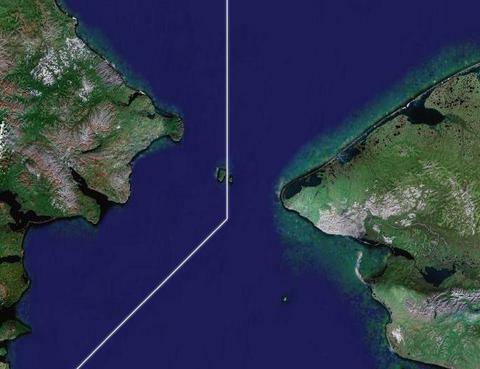 The big island on the Russian side of the international boundary is Big Diomede, and the U.S. island next to it is Little Diomede. You can't see Fairway Rock, a small island to the southeast of the Diomedes. 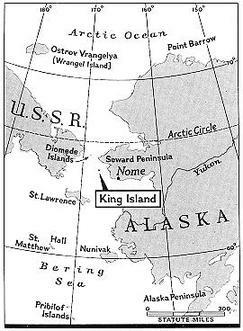 King Island is under the Seward Peninsula south of the straits. As the Arctic ice sheet shrinks, shipping will begin to move from the North Atlantic to the North Pacific across northern Norway and Russia, and across northern Canada and Alaska. 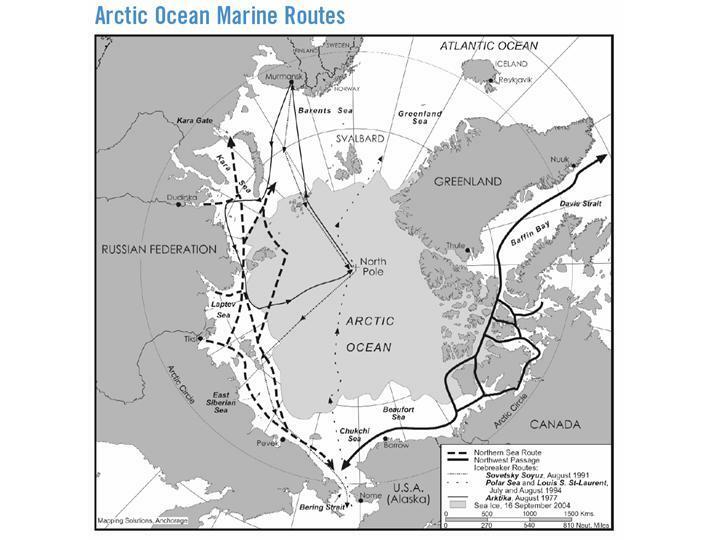 Both routes meet in the Chukchi Sea, merge, and transit the Bering Strait. Oil development, commercial fishing, tourism, scientific research, and military patrols are also going to contribute traffic. All of this will require infrastructure: ports, bases for sea-going tugs, air facilities, search and rescue bases, prepositioned oil spill response equipment, and aids to navigation. The Arctic sea ice melt season is over. The National Snow and Ice Data Center reports that the arctic ice cap "plummeted to the lowest levels since satellite measurements began in 1979. ": Arctic Sea Ice Shatters All Previous Record Lows. 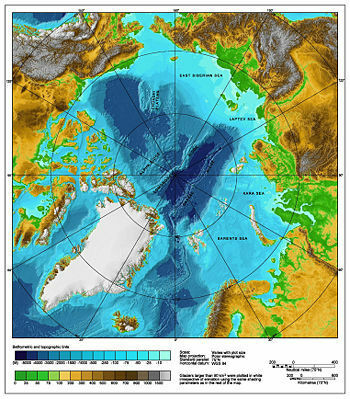 Diminished summer sea ice leads to opening of the fabled Northwest Passage . (press release, Oct 1). 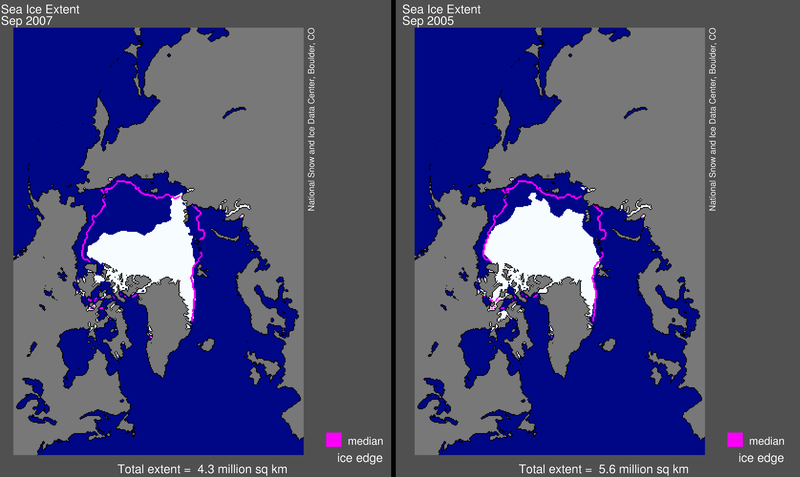 Figure 1: This image compares the average sea ice extent for September 2007 to September 2005; the magenta line indicates the long-term median from 1979 to 2000. September 2007 sea ice extent was 4.28, compared to 5.57 in September 2005. 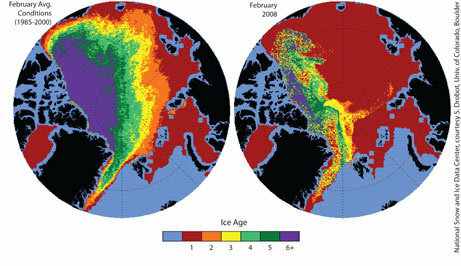 This image is from the NSIDC Sea Ice Index. Figure 2: The updated time series plot puts this summer’s sea ice extent in context with other years. 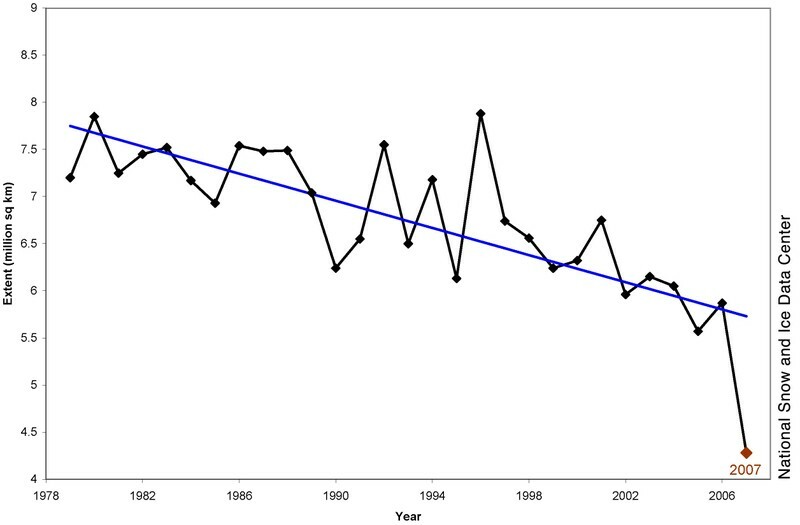 2007, shown in solid blue, is far below the previous record year of 2005, shown as a dashed line; September 2007 was 36% below where we would expect to be in an average year, shown in solid gray. 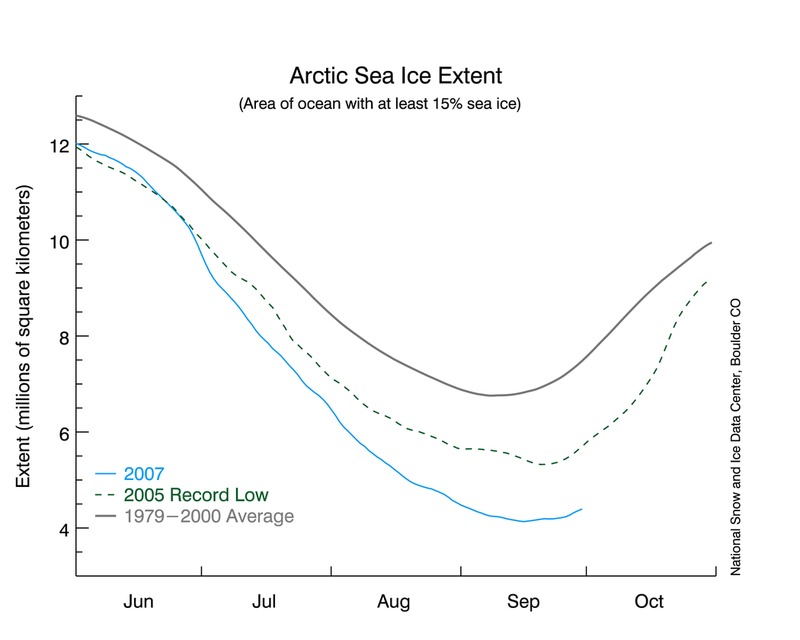 Figure 3: September ice extent from 1979 to 2007 shows an obvious decline. The September rate of sea ice decline since 1979 is now approximately 10 percent per decade, or 72,000 square kilometers (28,000 square miles) per year. "Alaska polar bears called doomed "
Last week the Russians dropped placed a Russian flag on the seabed below the North Pole. This was a stunt - drawing attention to a significant technological capability - but in itself without legal implications. As the summer Arctic ice cover shrinks, all sorts of natural resources are becoming available (Global warming is reducing the costs of mining in Greenland, July 16; ”We must prove the North Pole is an extension of the Russian continental shelf”, August 1). The ownership, control, and government of these resources are now becoming important issues. This goes for fisheries too. Alaska Senator Stevens has just introduced a resolution calling for: "the United States to initiate efforts with other nations to negotiate international agreements to better manage migratory and transboundary fish stocks in the Arctic Ocean": Senator Stevens Introduces Resolution to Protect Arctic Fisheries (press release, August 3). 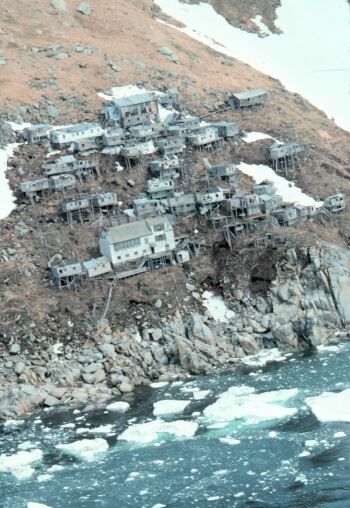 The North Pacific Fisheries Management Council is considering creating a fisheries management plan (FMP) for the Arctic regions under its jurisdiction. Here's an excellent discussion paper: Fishery Management Options for the Alaskan EEZ in the Chukchi and Beaufort Seas of the Arctic Ocean – A Revised Discussion Paper (Bill Wilson, North Pacific Council, April 2007). Chilingarov is a Russian Arctic explorer and the deputy speaker of the national parliament: Russia raises stakes over Arctic seabed. (Isabel Gorst , Financial Times, August 1). The U.S. Fish and Wildlife Service (FWS) wants to list the Polar Bear as threatened under the Endangered Species Act: U.S. Wants Polar Bears Listed as Threatened (Washington Post, Juliet Eilperin, Dec 26, 2006). The FWS proposed rule makes it clear that global warming and the shrinking Arctic ice cap plays a big role in this: Polar Bear listing proposed rule (January 9, 2007). Here is the FWS web page on polar bear issues: Polar Bear Conservation Issues. A couple of days ago I posted on related problems faced by walrus: Bad news for walruses (February 25). That post was based on a story by Dan Joling in the Anchorage Daily News. Russian trawlers are already being built to exploit the Arctic seas opened up as the sea ice shrinks as a result of global warming, scientists warned yesterday. Yet the international agreements which constrain oil, gas and fisheries activities in the High Arctic are at best rudimentary and at worst defective, a meeting in London heard yesterday. A year ago, I posted on new transportation routes that may be opened by the melting of the ice cap: Over the top (of the world) (Ben Muse, Oct 10, 2005). The future may be bright for Churchill, Manitoba. Suppose global warming melts the Arctic ice cap - at least in the summer? Will the Northwest Passage become viable? Will a shipping route across Russia's northern coast compete with the Suez Canal for traffic between Europe and East Asia? 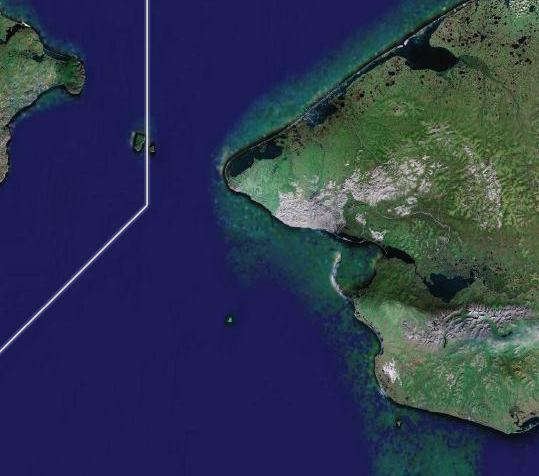 Will a lot of shipping pass through the Bering Straits? Clifford Krauss, Steven Lee Myers, Andrew C. Revkin and Simon Romero explored some potential economic impacts of the loss of the Arctic ice cap for the New York Times in As Polar Ice Turns to Water, Dreams of Treasure Abound (Oct 10). 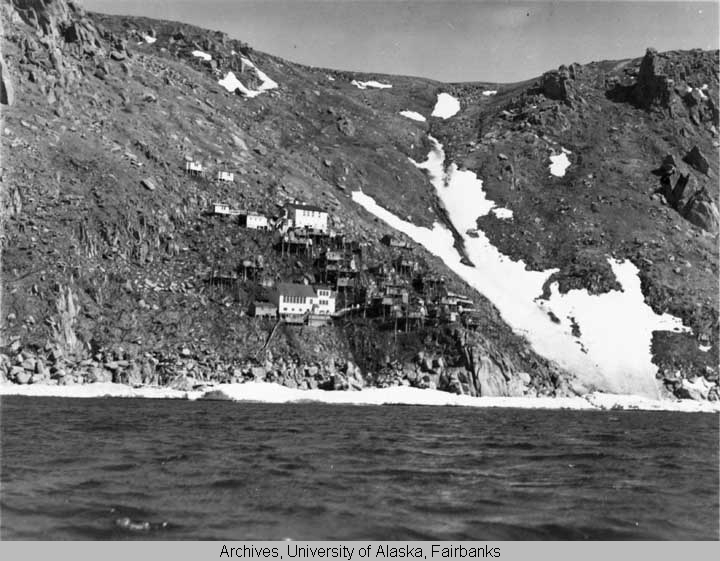 Jonathan Karpoff at the University of Washington has found that private 19th century Arctic and Antarctic exploration was more effective than public exploration. Even though government expeditions were larger and better funded, private expeditions were more productive, and at lower loss of life. Karpoff looked at the records of 92 public and private expeditions.